Hats off to Kulula airline for arranging the cheapest flight from Johannesburg to Durban. Kulula flight MN617 is scheduled to leave Johannesburg at 1730 and arrive in Durban at 2040 - the flight costs R448. This is the first time in our surveys of flights from Johannesburg to Durban that Kulula airline (operated by Comair) has been cheapest - really well done! When last was Kulula was cheapest in our surveys? We didn't realise that it had been so long since Kulula airline had been cheapest in our surveys, until we went and examined the stats. It was half a year ago, on the 21st July 2007 that Kulula last offered the cheapest flight (R288 for a flight from Cape Town to Durban). 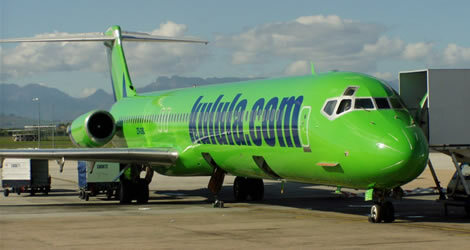 At this rate Kulula should next offer the cheapest flight in August 2008! SA Roadlink is still offering the cheapest bus ride from Johannesburg to Durban. At R99, this is less than a quarter of the cost of flying from Johannesburg to Durban. Ever wondered what all the landmarks are that you pass as you come in to land? We've detailed the landmarks as you approach Cape Town Airport travelling in a southerly direction. For instance, in the photo below we have the Ravensmead public swimming pool. The following photograph shows the construction which is busy at Cape Town International Airport (behind the wing of the South African Airways Airbus you can see a few cranes at work). The photo was taken in January 2008. In the foreground are several South African Airways ground crew, after a flight from Johannesburg to Cape Town. We wrote a short review of an SAA flight from Cape Town to Johannesburg. SAA's onboard meals have improved - well done to South African Airways. Photograph of a parked Lufthansa Boeing 747 taken from the international departures of Johannesburg Oliver Reginald Tambo International Airport. Michael O'Leary on whether he's an indispensable part of Ryanair? "(I'm) just a big mouth on top of a fantastic group of people. I think it's shite to say that I'm indispensable. This company stands on its own. It may have needed me ten years ago. There is a much deeper, wider management team at this company now than me. I am sadly and depressingly replaceable and dispensable, and at some point in time in the future it will replace me. I suspect it wont be in the near-term future, although I don't doubt there are some people who would like to see me resign or fired." Michael O'Leary (the man in charge of Ryanair flights); as written in the book by Alan Ruddock: s "A Life in Full Flight: The story of the man who made Ryanair take off".